Not too long ago I picked up some potted plants that had been on the ground for a while to find these two newts underneath. These bright orange, red spotted amphibians are a favorite of mine. Lately, we have been seeing them almost daily on our early morning dog walks. I knew that this was an amphibian with an interesting life cycle, but I began to question why there are so many tiny ones around this time of year and how they deal with the cold winter months. The orange newt is in its juvenile stage and is more accurately referred to as an "eft". Newts are a type of salamander, but unlike most salamanders the young part of their life takes place on land. Once they are adults they head back to the water. 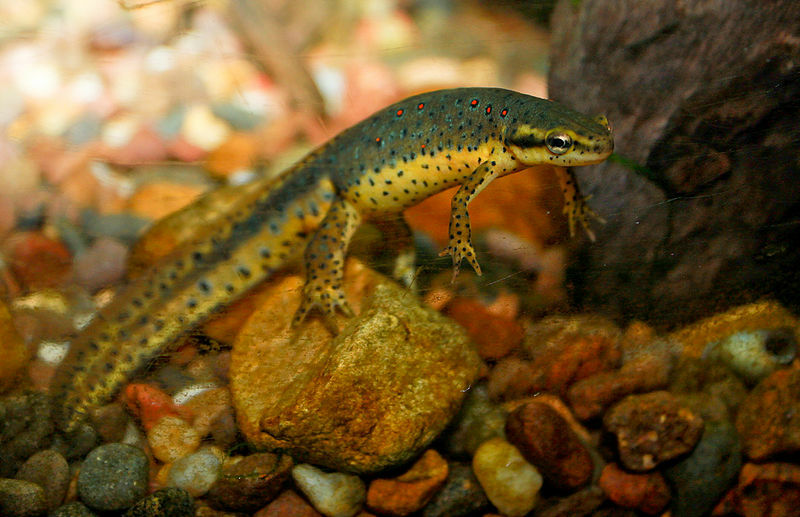 The adult newt, which is greenish with red spots, lays eggs in a pond or wetland in the early spring. They hatch and enter their larval stage. A larval newt is similar in color to the adult, but is smaller and has gills. The larvae feed on insects and other small invertebrates in the water. By late summer the larval newts have changed into orange efts and move onto land. The efts grow up to 4.5 cm or just under 2 inches long (although I believe I've seen larger ones). They may stay in this juvenile stage for 3-4 years! Then they begin to darken in color and become adults, returning to a place where they can spend time in and around the water. Adult newts grow to be around 12 cm, or almost 5 inches long. An Eastern newt can live up to 15 years! The bright orange color of the eft lets would-be predators know that it is poisonous. Although it lives on land it still must keep its skin moist. Most often you'll find them under logs or leaf litter, and dark moist parts of the forest. Over the winter the eft will hibernate in leaf litter on the forest floor. Brrr! The adult newt finds shelter away from frost just like the juvenile and hibernates over the winter. 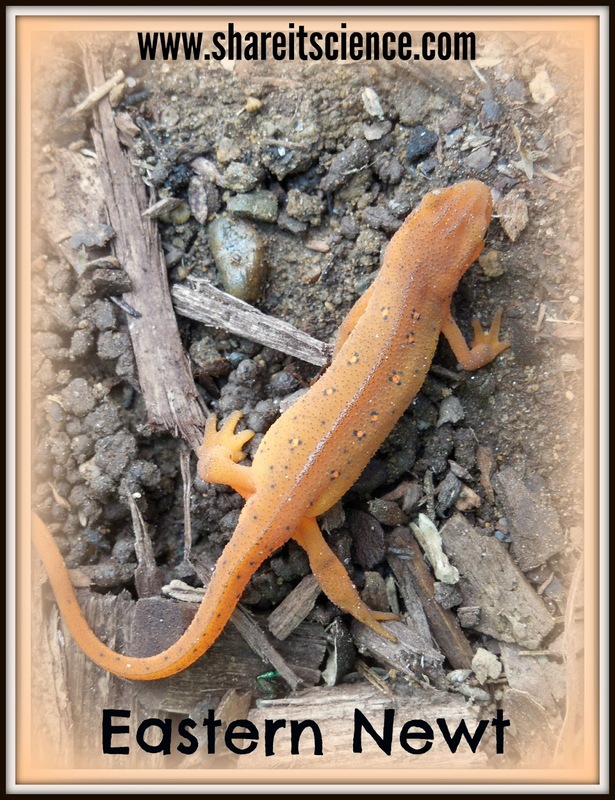 The Eastern, or red spotted newt is the only newt native to North America. The range of the Eastern newt is north to the Canadian Maritime Provinces, south to Florida and Alabama and west over to Texas and up through the Great Lakes. Have you spotted any tiny efts lately in your outdoor excursions? It's worth a look, they are beautiful little creatures! Comment below with your discoveries, or share them with us on Facebook or Google+. I love growing plants in containers because it saves space and helps in a yard with limited direct sunlight. 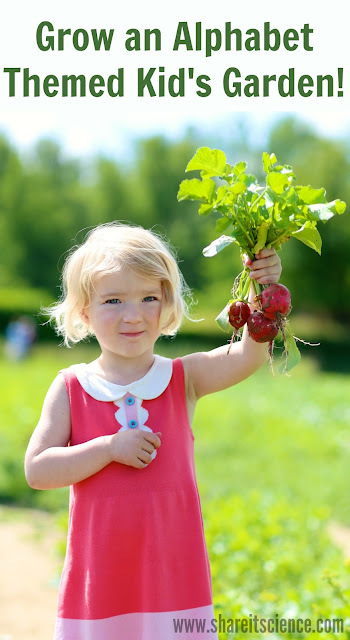 It is also makes gardening with kids a little more accessible. This post contains affiliate links, please see disclosures for more information. 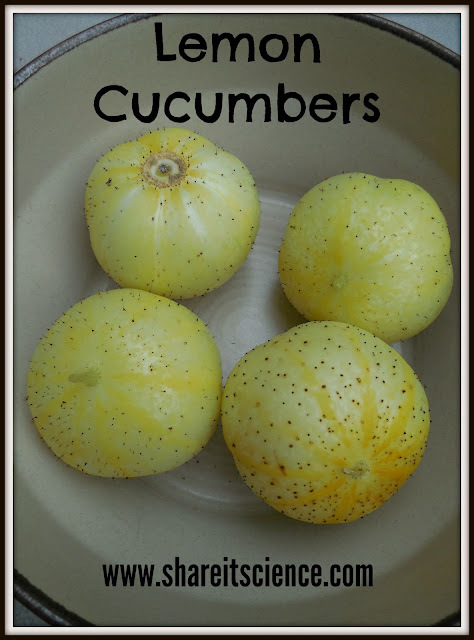 One of the container plants we have enjoyed growing the past 2 summers are heirloom Lemon Cucumbers. This year I have a bumper crop, which is nice because my other plants haven't been super productive! Lemon cucumbers are named for their shape, not their taste. They are round palm-sized cucumbers that can easily be eaten in one sitting. They taste like any other cucumber, not too sweet and in my experience never bitter. They are an excellent choice for the garden if you are gardening with kids! Last year we grew them in a small pot with a little trellis. After seeing the far reach of their sturdy vines, I decided this year to give them some more space. They are enjoying the barrel planter they are in and were happy to vine up the fencing and strings that I had tied in for support. Their tendrils are beautiful and fascinating. You can read more about the fascinating science behind these cucumber tendrils in my post: "Glimpse of the Garden: Week 16, Tendrils-Plants in Motion"
I learned about these great little cucumbers in my favorite container garden book, Grow Great Grub: Organic Food from Small Spaces . You might be familiar with the author, Gayla Trail, from her website, "You Grow Girl". I highly suggest both the book and website if you are interested in gardening but have limited space. 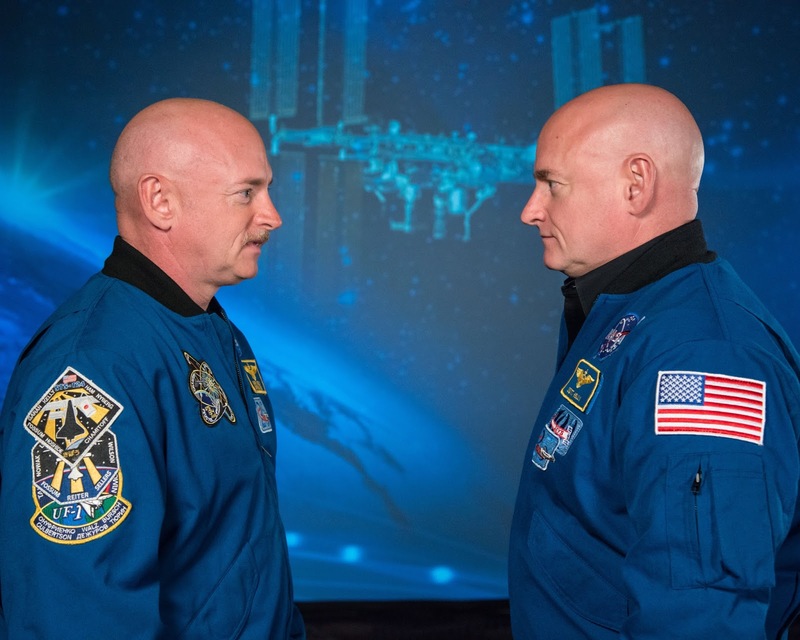 NASA is in the midst of an unprecedented and fascinating study involving twins, and astronauts Scott and Mark Kelly. 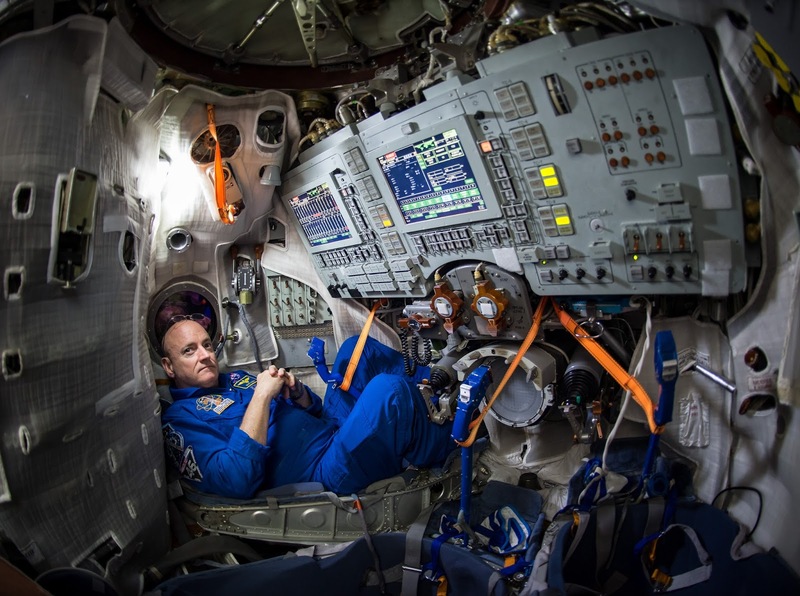 In order for NASA's Journey to Mars to come to fruition, we need to understand a lot more about the effects of long term space exploration on the human body. A round trip to Mars would most likely be a three year trip. There are many opportunities for education using the NASA twin study as a launching point. The most obvious ones have to do with space travel and NASA has you covered for educational resources. 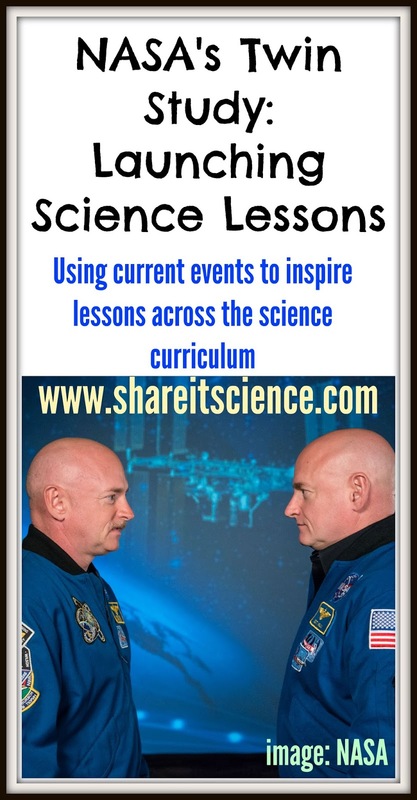 Check out their educators page for a wealth of lessons, activities and free materials. How about using the twin study as an introduction to human physiology lessons? How does zero-gravity affect the skeleton? The muscular system? How do these systems work anyway? Super Skeletons, Pre-K - 8th grade (Scholastic Instructor) Build a bone model and more! Supporting Structures, 1st-6th grade (National Space Biomedical Research Institute) How do animals support themselves when gravity is present? Space Stations- Sponge Spool Spines, K-7th grade (Lunar and Planetary Institute) Simulate what happens to the human spine in space. 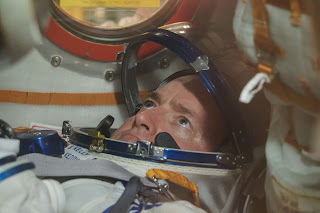 Train Like an Astronaut! All ages (NASA) A series of physical activity exercises using graphing and data collection skills, where kids mimic astronaut training. Gravity and Muscles, 1st-6th grade (National Space Biomedical Research Institute) How the body adjusts to the force of gravity to stay balanced. Twins! What are the genetics behind this phenomena? How can we investigate genes and DNA? Twins! 6th-8th grade (Discovery Education) An overview of the genetics of twins. Introduction to Heritable Traits, 1st-6th grade (University of Utah) Basics of genetics and traits, several fun activities. What sort? 3rd-9th grade (University of Nebraska State Museum) Learn to sort and organize chromosomes just like genetic scientists do! So what is the deal with gravity anyway? Gravity in Action, 1st-6th grade (Try Science) Experiment with the effects of gravity on a slow falling object using parachutes. What Goes Up..., Pre-K-3rd grade (Center of Science and Industry) A simple gravity lesson using toys. What are some of the characteristics of space? What is it like in the International Space Station? 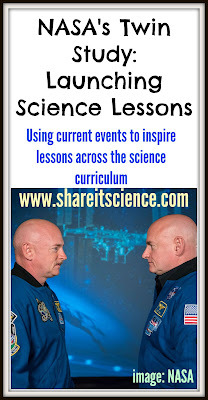 Life in Space: The International Space Station, 3rd-5th grade (Teach Engineering) Several different activities to get students thinking about life on the space station. Zoom: Travel to a Star and Back to Earth, 6th-High School (Center of Science and Industry) An online simulation takes you to a star and back. By adjusting speed and distance parameters students learn about the passage of time in space and on Earth with the theory of relativity. 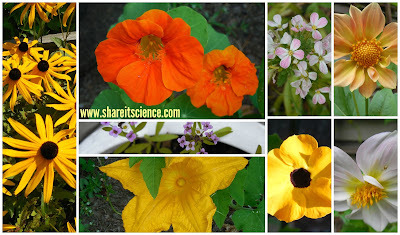 Find other great videos like these for teaching science in my post: "10 Tried and True Videos for Teaching Science"
The other day I was out in my yard and noticed something brilliantly red in contrast to the green grass. I couldn't believe it, a tree was already beginning to change color and drop its leaves! I love fall, but I don't know if I am quite ready to leave summer behind. 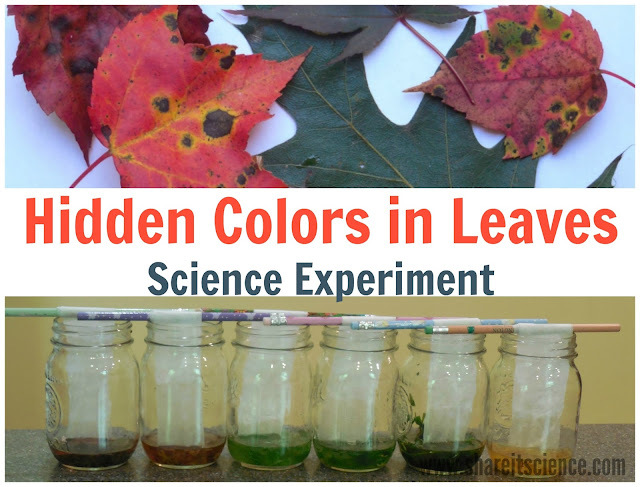 Although it did get me thinking about the colors in leaves and how this was a great opportunity for science! Here is a great experiment for any time of year that illustrates why leaves change color in the fall in colder climates. Try this experiment as a demonstration for young students, or as a hands-on project for elementary or middle school. This post contains affiliate links, see disclosures for details. 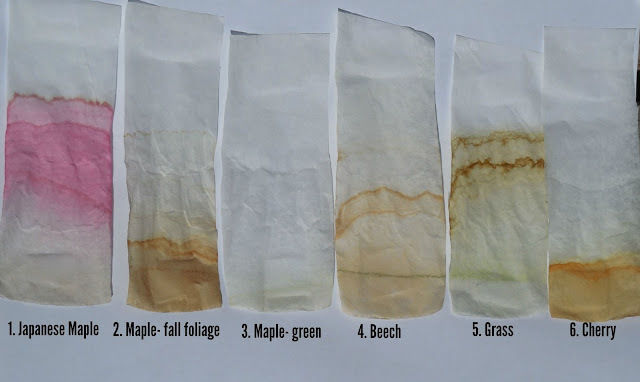 Why do some tree's leaves turn different colors in the fall? This beautiful act of nature has to do with the pigments in leaves. You are probably already familiar with one of the pigments- chlorophyll. Chlorophyll is the pigment that makes plants green. 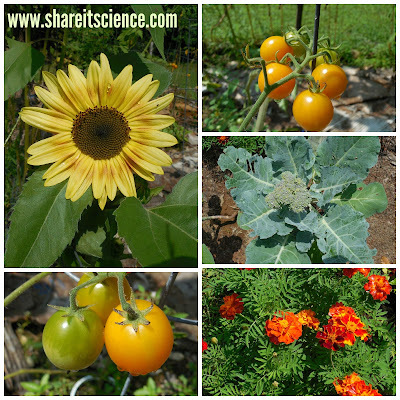 It is very important in photosynthesis, the process by which plants make their own food, as it allows plants to absorb the energy in light. Although green is the color we associate with most plant leaves, there are other pigments in plants. 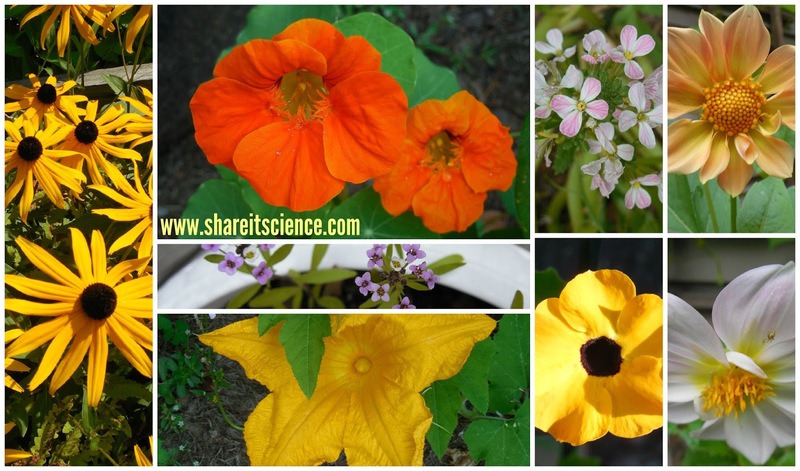 Carotenoids are orange and yellow pigments that are in leaves all year round. During the growing season these pigments are masked by the green chlorophyll. As the tree begins to "shut itself down" or go dormant for the winter, it is not making chlorophyll any longer and the other colors begin to shine through. Anthocyanins are pigments that are not present all year in the leaf, but are produced there as the summer comes to an end. These pigments are responsible for the reds and purples we see in fall foliage. How can we find out what colors are in a leaf? Chromatography! Chromatography is the process of separating mixtures, in this case colored pigments. Here is a kid-friendly version of leaf chromatography appropriate for home or school. Collect a variety of leaves. I chose different colors just to see what would happen. My hypothesis was that I would see the most variation of pigments in the green tree leaves, like the maple and beech. Grind up the leaves. This is the fun part! You can crunch, tear and grind them up with your fingers, or grind them with a little bit of water in a mortar and pestle. Kids love using the mortar and pestle and you can get them fairly inexpensively. Cut the coffee filters into strips. The middle of the filter works the best as it is the widest, but any strip will work. Roll one end of the strip around a pencil. Adjust the height so that when you place it in the liquid it is just barely touching. Secure it with a small piece of tape. Put your strip in the leaf mixture and let it sit overnight. The next day pull the strips out and let them dry. Then observe! What do you notice? Look carefully, there will be tiny stripes of different colors. The most water soluble pigments will travel the furthest. What pigments do you see in each leaf? Are you surprised by the results? Why? Some really pretty pigments in the Japanese Maple Leaf (L), and mostly browns in the red Maple leaves (R). Notice the thin line of green pigment (Chlorophyll!) on the bottom of the Beech leaf (L) and the Grass (R). 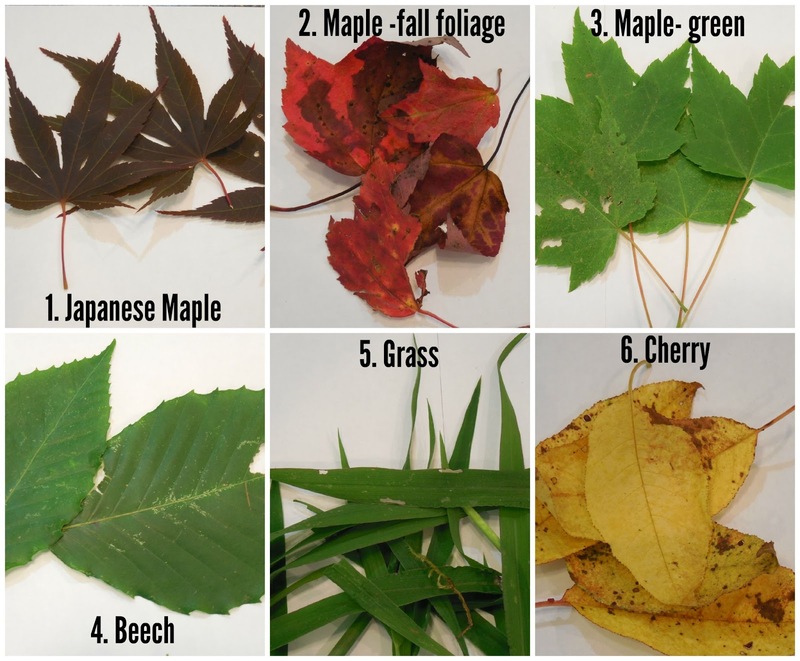 I am excited to compare these end of summer results with the same leaf types in the spring! Do you predict there will be a difference? Have fun experimenting! I'd love to hear about your results! 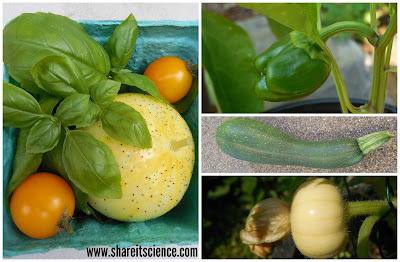 If you are interested in plant STEM, you'll also like to try this seed engineering design challenge. Also check out this collection of autumn science activities. Tons of great plant science activities on my Pinterest Board! 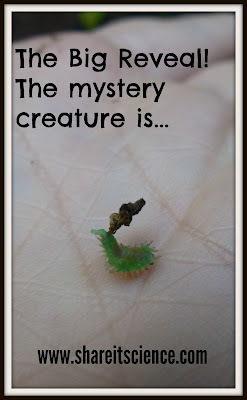 Glimpse of the Garden: Week 21, Insect Mystery Revealed! 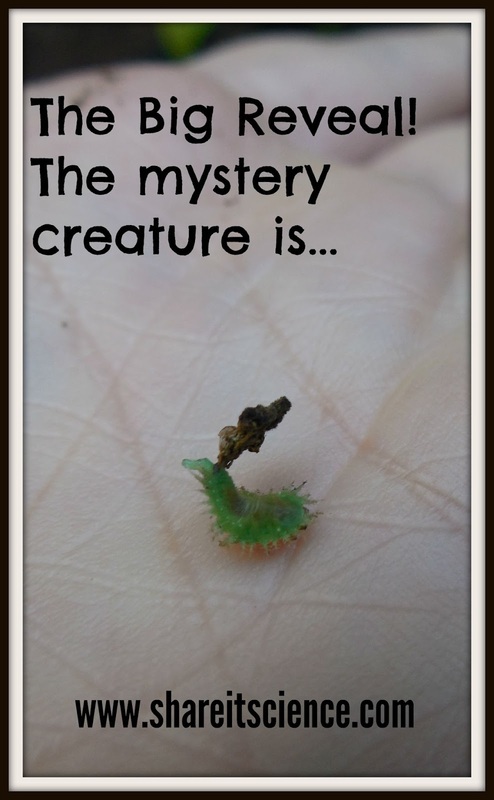 Did you figure out what my mysterious creature was last week? If you looked over some of the old "Glimpse of the Garden" posts, you may recall seeing one about the Tortoise Beetle. You guessed it! 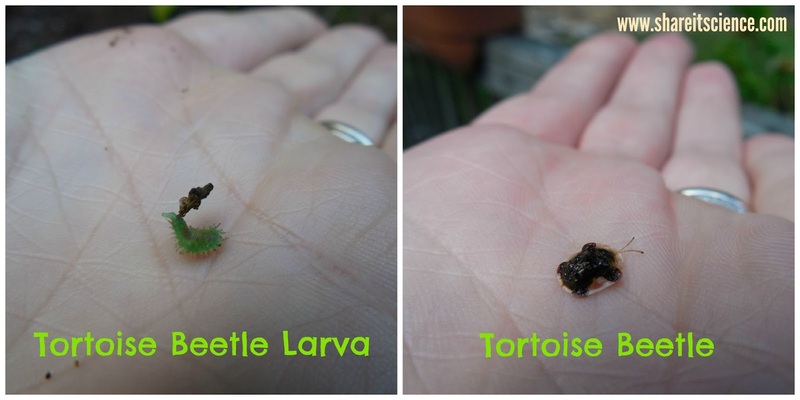 My mystery creature is a tortoise beetle larva. Not only is this a fascinating beetle, but it turns out that its larva may be even more unique! The larva's protective shield I described in last week's post is made of old exoskeleton molts and its own feces. Yup. Its own feces. Watch this video to see how it builds its shield- this is definitely one for the gross but incredibly amazing file! In other garden news, it's nice to have some veggies to harvest, even if it hasn't turned out to be a very fruitful gardening year. The plants are beautiful, but it's been a cool summer in these parts, our growing days are dwindling with very little produce to show for my efforts! Yum! Nothing more yummy than fresh basil and tomatoes! More lemon cucumbers, bell peppers are coming, finally a zucchini that matured instead of rotting on the vine, and a "mini pumpkin" gourd. This week's blooms: Black-eyed Susans, Nasturtium, Alyssum, Zucchini blossom, Radish flowers, Dwarf Dahlias and Black-eyed Susan Vine. Lots of oranges and yellows! 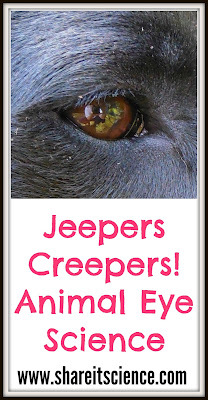 Two recent scientific studies really highlight how fascinating animal eyes are. The first looks at the different ways animals see color and how this impacts camouflage, predation and animal/plant signaling. Scientists at the University of Exeter developed software to convert digital photos into the color scheme that different animals see in. Up until now it has been difficult to use digital photography for this type of research. This software will be helpful to scientists in the future as we continue to study animal physiology and how animals interact with their environment. What is most exciting about the software is that anyone can download it for free. I was excited to try it, but found I lacked some of the technical expertise that it might take to use it on my own photos. If you are tech and photography savvy or know someone who is, then you probably will find it interesting. You can find the download at this site. In the meantime, you can see differences in animal vision by visiting this article from Nautilus science magazine: "How Animals See the World". In this article you can use the interactive pictures to change the image from what a human can see to what an animal sees. You can also visit Jolyon Troscianko's website to see some of his photography using the software he helped develop at the University of Exeter. The second study, published in the journal Science Advances, on animal eyes dealt with the shape of the pupils of predatory animals and prey animals. Vertical pupils, like those you might see in a cat or fox, help these predatory animals pinpoint the location of their next meal. This shape of pupil makes it easy to see vertically shaped objects more clearly at further distances and horizontal shapes blurry over fairly small distances. It is thought that this contrast helps the animal triangulate and find exactly where it's prey is. The horizontal shape of the pupil of many prey animals, like deer, allow greater panoramic vision and help to shield light. These features could help an animal spot a predator from further away. 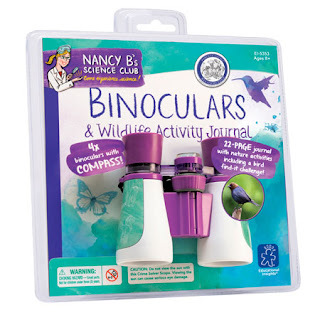 It would be a fun classroom or at-home activity to look at a variety of animal eyes and try to determine what sort of animal it is based on the pupil shape. 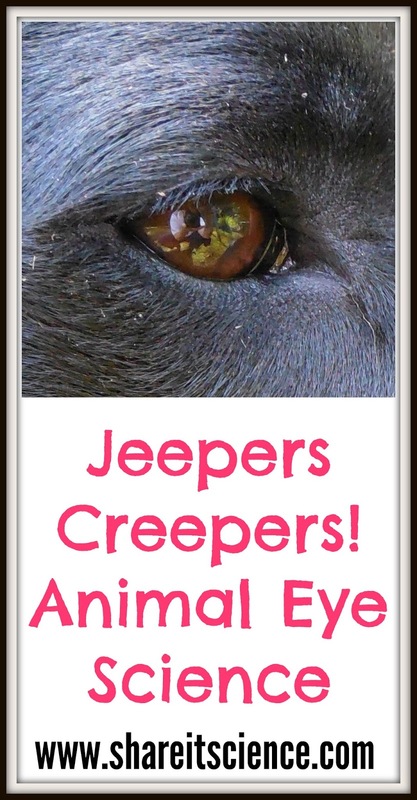 Interested in learning more about animal eyes? 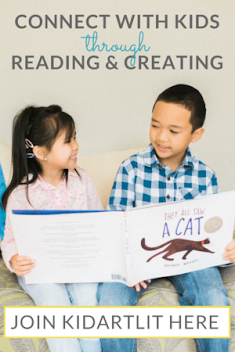 Check out my blog post: "Just the Right Length: Eyelash Physics" to learn about animal eyelashes, find links to lesson plans and resources about eyes and some suggestions for great books about animal eyes to share with kids. Washington Post: "This new software can give you animal vision"
Science News: "Power of pupils is in their shape"
Share it! Science News: "Just the Right Length: Eyelash Physics"
Nautilus: "How animals see the world"
I love it when I find a renewed curiosity in something I've seen many times before. This summer while spending a few days on vacation at a New England pond, I spied some mussels in the shallow water near the shore. This was not really shocking, as I remember finding them in the lake and this same pond as a kid. However, I looked at these creatures with a new sense of wonder. First of all, there were a lot more than I remembered. What did this mean? Were the water conditions better or worse? A lot of people fish this pond, do they also collect and eat freshwater mussels? How quickly could these creatures bury themselves in the sand? I picked a few out of the water to inspect more closely. They quickly pulled themselves shut tight once they sensed something was plucking them from their peaceful mud. I didn't keep them out of the water long, suffering pangs of guilt remembering how I used to enjoy throwing them back into the lake when I was young. Sorry mussels! I put these back into the water, one back in the hole I plucked it from and two on their sides, hoping to observe and determine how long it would take them to burrow back down. Unfortunately we had some bad storms come through so I wasn't able to check on my science experiment. When I checked the next day, there was only the mussel that I had stuck in the mud, the others had moved on. Upon further research once returning home, I found that these fairly uninteresting looking mollusks are actually really fascinating animals. Mollusks are invertebrates with soft unsegmented bodies and in most cases outer shells, a very large and diverse group that spans from octopus to shellfish. The mussel is a bivalve, it has two shells that are held together by a strong ligament. Freshwater mussels have a strong, large foot which they move through the sand or gravel with. Mussels have strong muscles (isn't that funny?) to help them open and close their shells tight when necessary. They are filter feeders that siphon water into their shells, filter bits of debris and plankton in to eat and then pump the waste water back out. Freshwater mussels are helpful in keeping waterways clean and are important indicator species as they take in any toxins that might be in the water. 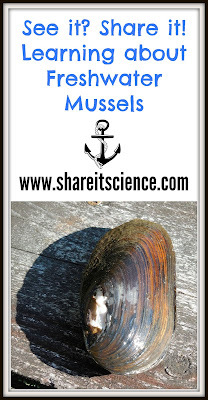 Where there are many mussels it can mean that the water quality is good. Although I have no data on the population size of these creatures decades ago compared to now, in my estimation there were many more then when I was a kid and the water was more clear. There are many types of freshwater mussels and many are threatened or are listed as species of concern due to declining populations. I believe the mussels I observed were Eastern elliptio, which is a species that has a stable population. I did not learn whether people collect and eat these, but the local Department of Environmental Services urges people not to consume them as they accumulate any pollution that might be in the water in their bodies through their filtration systems. 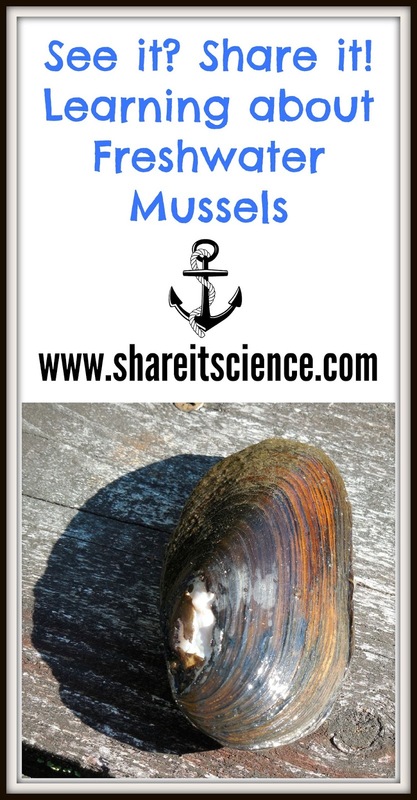 I also learned from this blog post by Northeastern Ecological Services that mussels have some pretty funny common names, like monkeyface and strange floater! I guess when you study mussels for a living you probably have a good sense of humor! I have always loved seashells and now as an adult I appreciate the ones with inhabitants just as much as those I can collect for souvenirs. If you or your children enjoy collecting shells, or observing life near a body of water, particularly by the ocean, I highly recommend "Seashells by the Seashore" by Marianne Berkes, illustrated by Robert Noreika. In this lovely picture book with rhyming text a girl collects seashells for her grandmother. There is an educational piece about each type of shell she collects at the end of the story. Click book images for more information! Another great book for exploring seashells is "Next Time You See a Seashell" by Emily Morgan. It has excellent photographs and encourages young readers to observe deeply. For exploration around the pond I love "Around the Pond: Who's Been Here?" by Lindsay Barrett George. Another beautifully illustrated book where a brother and sister use observations and natural clues to determine what animals live near the pond. It works very nicely as a guessing game for elementary aged children. Watch the Perseid Meteor Shower! Reader Photos- The "Garden of Awesomeness"